As an owner of your Subliminal Power software, I would like to say thanks for a fantastic product. 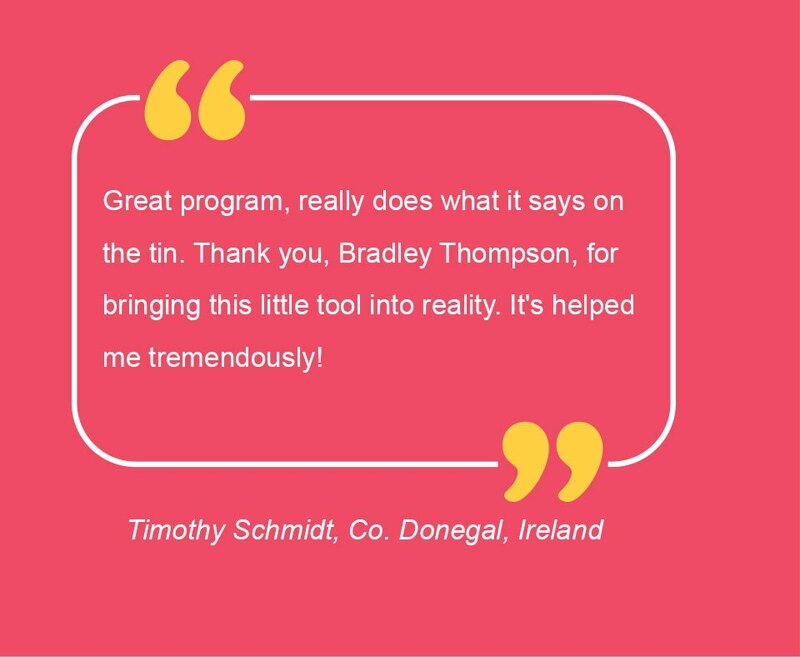 I was so impressed by your software I recommended it throughout my followup course that clients receive when they purchase my software! I am seeing results already after only two days. The reason I say that is because I am generally negative about things in thoughts and otherwise. But that hasn't been the case lately, is it possible? Dang, cant wait to see what tomorrow brings!! You tell that Thompson fellow he is onto something. Glad I found you folks, I have been looking for quite some time for something to work on my subconscious without the loonnnngggg boring reading and sitting in strange position. Didn't work. But the subliminal power is doing it and FAST!! Feel free to use my testimonial if you wish. You would be crazy not too!! … I setup the program on Tuesday and forgot all about it. I've always been seriously afraid of public speaking and had a big presentation I had to host on Friday afternoon. I'd forgotten all about Subliminal Power by Friday. But instead of sticky hands and major nerves, I just realized I really wasn't afraid anymore. I delivered the best speech I've ever given and even had people belly-laughing. That makes me feel SO proud. You CURED my fear of speaking... now I'm going to work on my weight and charisma! to all of my clients. Excellent! Not easily impressed, but this is one exciting program. It will NOT get uninstalled. This is not a question, rather a statement. I have only had Subliminal Power four days. Wednesday, I was up early and cleaned out a whole room that I had put off for six months because of the amount of stuff in it. I did it all in less than 1 hour and was amazed at how effortless it was. I went jogging Thursday morning and to my surprise my normal four mile run turned into SIX MILES in an instant. When I finished, I felt as though primatine mist or something must have been in my lungs - because I was NOT out of breath at ANY point during the run. Wow. I'm AMAZED. How do you do it? Excellent. 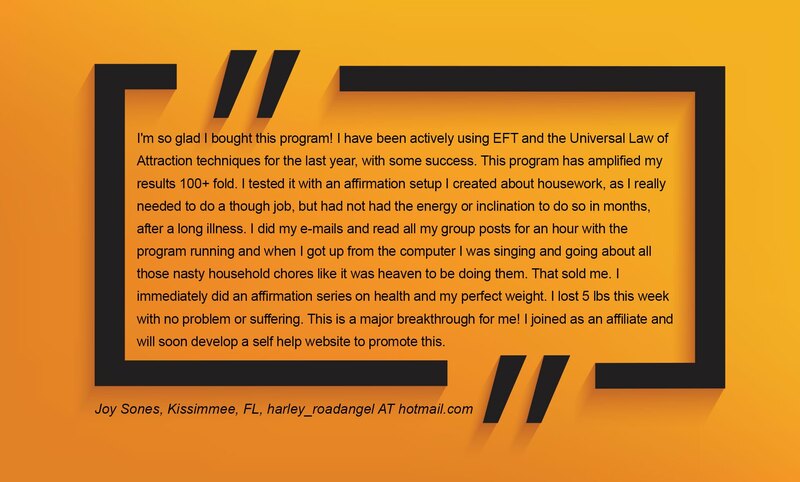 I highly recommend this all of my clients for changing their lives in the quickest way possible. Just install on your computer, tick the programs you want to use, and you're done. I've worked in the self-development industry for 30 years, and this is one of the best self-change systems I've ever encountered. I wanted to write you today to ask you to pass on my sincere thanks to the creators of Subliminal Power. I know that a project such as this must take a very large amount of time to complete and maintain, however I wanted you to know that a small group of five of us in the Women's Institute here are using it on a daily basis and seeing amazing results. Thank you! I've been chosen to play the lead in our college crucible production of West Side Story. I'm playing Maria and had been having real trouble reaching those higher notes. I wanted to write and say your singing program on the Subliminal Power Add-On CD worked just wonders. This is amazing, I'm telling all of my non-singing friends about it. Thank you again, and to anyone that's thinking of buying Subliminal Power, DO IT -- because it really does work. Feel free to write to me or call me, I'll tell you myself! Please IMMEDIATELY stop selling this to business people, I want it all to myself! I thought I'd let you know how I'm using Subliminal Power. I run my own media LLC here in the States and have been trying to formulate an advertising plan for the past couple of weeks. I'd forgotten I'd installed Subliminal Power a few weeks ago to help lose weight (which is working brilliantly, BTW!) - so I selected the creativity and business success programs, then forgot about it again. This morning, the SECOND I sat down at my PC, a million ideas rushed to my head and suddenly I knew everything I needed to do. I have the perfect advertising campaign in my head. Who needs employees when you've got this magic thing? I never ever write with 'testimonials,' but I really felt I had to this morning. I installed Subliminal Power a few days ago and have had... just SO MANY positive experience since, I can't get over it. It's like the program has made a million synchronicities happen for me, with no hard work from me. My mood has also improved and I just can't wait to see what tomorrow brings! I run a northern radio station [name removed on request] and get so tired each day, and worried about the stresses of my schedules. A week ago I installed your program and I feel like telling you just how much of a difference it's made. I don't feel stressed anymore and it works perfectly, even with my old PC and cranky software. I'm even running one of your subliminal programs now for sleep reduction, so I can spend more time enjoying life as it's meant to be enjoyed! Power is something new to me and having had epilepsy for forty years, I started as suggested and just ticked two items. This was to start slowly and get used to it. I only used the program for a few minutes at first until I realised it was working. It felt strange so I paused, had a rest until I felt okay and have been using the program for longer sessions each day. 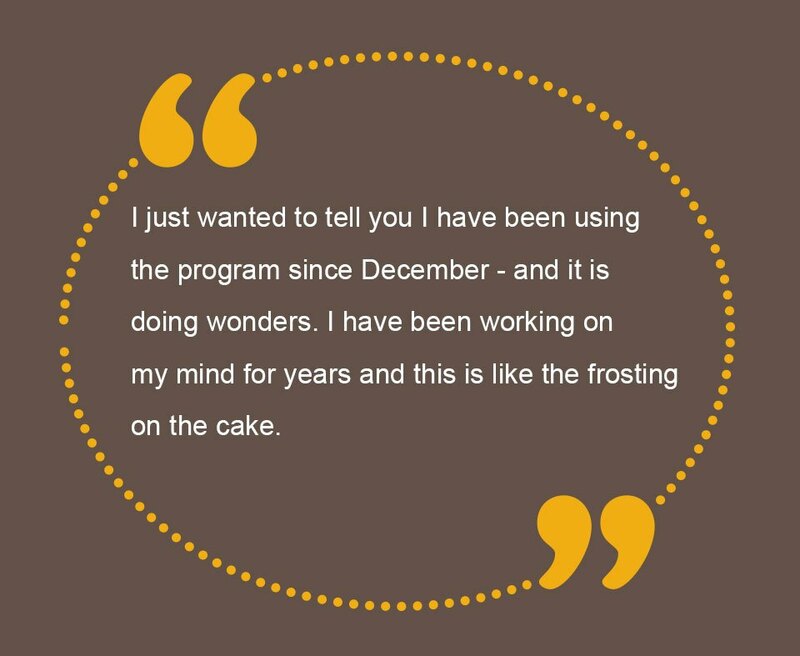 It may take me a bit of time as I don't use the computer or program for long yet, but I must say after just the first one or two short sessions I felt I was making progress with the help of the program and I'm sure with gradual increase in use I will make a lot of progress! Had great success when I first used this program three years ago. Revisiting it again now, with my free upgrade, I'm just 'gobsmacked' as my British boyfriend says. Fantastic job!! I've not always been the pure person I wanted to be, especially when it comes to alcohol and gambling. I've been in recovery now for a month (God Bless this city's resources!) and wanted you to know that your program put me on the track to success. I can feel a real difference in the way I look at things... even in the way I walk. Please tell your Bradley Thompson he's owed a big eat-everything meal next time he visits my state! This is not a question, but rather praise for a program well written. I want to thank you and let you know that this program is fully appreciated! I love the fact that not only can I create my own personal programs relating to my work, but if my children are on my computer, a couple of clicks makes sure it is streamlined for them! It helps to enable them to achieve more at school, and have better self esteem. It is easy and effortless to use and extremely effective. Again I thank you for this great program and the time you have given me to gush! Please pass this message to Bradley Thompson. YOU DA MAN! I never thought it'd work, but I've used Subliminal Power over the past couple of weeks to help cure a very long-standing acne problem. Well, I can't believe the difference it's made -- my skin has improved beyond anything I could have hoped for. I still have a few weeks to go, but at this rate, my skin will be perfect by the end of the month"
My best score (not Olympic standard of course) has increased from 88/100 to 93/100 and I now average mid to high 80s rather than low 80s. The magnitude of this increase in such a short time (less than one month) is absolutely all down to Subliminal Power! Please fell free to use any or all of my comments in your publicity if you wish. Mr Thompson is revealing the power of the human subconscious to people who would probably never go to see a 'shrink' or a 'hypno', assuming that they could even afford it. Wow, I've been using Subliminal Power for just over a day and I ALREADY feel like writing to provide good feedback. I can literally FEEL its effect on my body. I feel like I have so much more energy, passion and enthusiasm... and can feel it all working at a very deep level. I can tell this is going to become my number one self improvement tool!! Work as a home trader Mum, staring at my two monitors all day, and often take time out to get into the mysterious 'zen' of trading. I used to meditate every morning in order to get into my "Zone" for the day, as a lot of traders do. Since using Subliminal Power, I don't even feel the need to do that anymore. With the right subliminal programs, I feel like I'm in what you call the "flow state" every single day. AND I have two monitors, so I'm getting double the power for my money! Can't tell you how much I love Sub-Power!! reprogramming your mind in a safe, honest, real way. Love it, keep it on! I'm a freelance writer and always in need of creativity. I can't live without it and often find myself struggling with writer's block. It's only been a week since I started using Subliminal Power, but my mind has been literally overflowing with new ideas.. plus, my writing has just flowed so perfectly since Subliminal Power has been installed on my PC. I can feel it coming from inside. This is NOT a coincidence!! I've been using this to improve my "student" mathematics and, WOW, you guys have helped it. I used to be a very poor Sudoku player -- love it, but could never properly play it. Now I can handle even the difficult puzzles within a few minutes. As though everything has fallen into place. How do you do it?? This is a trick I found to amplify results: you can add it to your testimonial page. I use the Law of Attraction principles, but was 'stuck.' It has been mentioned to hold a positive thought and use emotion to amplify results. I experimented: I popped in a really happy music CD, a 50's Rockin Round The Clock one. It's playing in Windows Media Player, flashing kewl lights, very hypnotic. I set up some short positive affirmations in bold type at size 36 font to be centered on the screen. I set it at the highest visibility of the phrases. I also set it to flash every 5 seconds for 900 milliseconds. I also capitalized all the letters and added exclamation points. Then I devoted the time it took for four songs to play. I was clapping my hands... jamming to the music all happy inside while concentrating on the affirmations flashing. Now one of my affirmations was ... I LOVE TO WORKOUT! Before the first song was done, I was dragging out my gazelle and working out as I watched the screen and listened. I couldn't help myself, as the desire to workout was that great. This is the best I've felt inside and outside with using this program, and I've had it over a year. I've always had results, but this way of using it seems to have magnified things. I wanted to pass this on to others. I have used this software and is fantastic, fully customizable and the Lucid Dream module is great after two days of using it I can remember my dreams very vividly. If you want your boy to learn put him to study in front of the computer and make your own statements like: I am very good at math and things like that. I recommend this program. I just wanted to tell you that my life has changed dramatically, since starting using your product several weeks ago. My intelligence has improved to the point I have laser sharp focus... I now know which direction my life is going in... And I am even looking at business ideas, something I would've never done before. This is only the beginning! I can definitely recommend you guys. You're great and I love you..
"We asked that teacher and the other teachers, one question, and that was, "Does he look you in the eye while you are talking to him or the class?" They all replied, "Why yes he does!" When you look someone in the eye while they are talking it shows great respect for the person and shows you have an interest in what they want to say. I love that. I can't say enough about Subliminal Power and I just wanted you to know.